Are there too many photobooks? Is the current production rate with which photobooks are being churned out into the market sustainable? I don’t know. From what I hear, most people seem to think it’s not. The medium photobook is great for photography, but it seems that somehow a combination of hype and maybe too dramatically lowered barriers of entry have resulted in too many photobooks being made. This is not to say that photographers shouldn’t make photobooks – quite on the contrary. But much like a few years ago, when photographers thought they all needed a blog (to be successful), now it’s a photobook (to be successful). And if some publisher won’t publish it, then it’s got to be self published (so you can be happy and successful – it’s a win-win situation). As much as I appreciate self-publishing, given that if in doubt, I will always side with the iconoclasts, there just is this one detail: if you self-publish, you really want to think about beating publishers at their game – and not somehow convince yourself that somehow, they’ll be interested in beating you at your game. What I mean by that is that whatever you want to say about publishers (insert the usual populist sentiments about gatekeepers here), they know what they’re doing (some more than others, of course). There are quite a few publishers where as a critic/viewer/consumer/collector I know exactly what I’ll get, in terms of their commitment to the medium photobook (which then translates into the various quality aspects). As a self-publisher, you can bring that same commitment to your book, but more often than not it’s not happening. There’s a lot of talk of narrative in photobook circles today, almost to the point of making one wonder what happened to the idea of the book that is simply a collection of photographs. Regardless of whether you want to call this type of book a catalogue or not, it seems obvious that for a lot of work this format is exactly what is needed. 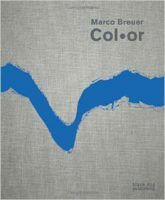 A wonderful example is provided by Marco Breuer‘s Col• or . For years now, Breuer has been working with photo paper, treating it in all the kinds of ways that artists attempting to produce a “proper” photograph on it would definitely try to avoid: scratching it, folding it up, burning it, etc. The results of this kind of process are all unique, both as objects themselves, but also in terms of how they’re positioned in the world of contemporary photography. Ever since I first saw these pictures, I have been mentally connecting it with some of Gerhard Richter’s abstract paintings. Their support, the paper, makes them photographic. As unique objects, firmly subjected to their maker’s touch, they live in Richter’s world. What would or could possibly be gained from examining whether Breuer’s pictures are indeed photographs or not I don’t know (if they’re not photographs, then what else are they?). I do see them as photographs simply because they point at how flexible the medium actually can be, at how wide a mode of expression it allows for. With the New Formalism exploring how the photograph as an image and artifact is being dissolved by both what we know about it and by basic computer technologies, Breuer sits at the opposite spectrum, destroying the very carrier photographs used to be fixed upon. As a book, Col• or does the work the kind of justice it requires. The images are reproduced at full scale, bringing the viewer as close to seeing the originals as is possible with reproductions. In book form, the viewer’s engagement with the work differs from seeing it on the wall, allowing for the repeated exposure that it ultimately demands. 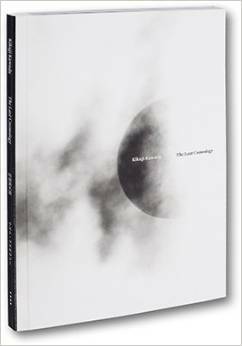 Reviewing Kikuji Kawada‘s The Last Cosmology is a fiendishly difficult task for me, given that Chizu (The Map) is my favourite photobook by a mile (I own the Nazraeli reprint from about a decade ago). How can I not compare? How can I not have that killer book in mind, looking at this new one? Well, I can certainly try. I also used to be an actual cosmologist before I came to photography. What does The Last Cosmology have with this part of astrophysics? Nothing. Nothing, and everything. Much like Chizu, The Last Cosmology relies on the juxtaposition of images that at first appear to have little to do with each other. There are frequent photographs of celestial objects, against which images taken from the world we are more familiar with are juxtaposed. Unlike in Chizu, though, Kawada plays less with abstractions. Instead, he pushes things more into a level of descriptiveness that at first might confound the viewer. Crucially, blank space is kept white, which for me perhaps created the biggest contrast with the earlier book. Both Chizu and The Last Cosmology are deeply introspective, but the overall darkness and menace of the former keeps the book closed and claustrophobic, while the visual space provided by the latter has the viewer’s mind attempt to expand beyond its own confines. Looking through this new book requires considerable mental energy from the viewer. It at first appears to present us with what we might expect, to then show us how little we actually gain from encountering it. It’s a cosmology that cannot be fully understood, that presents more riddles for every one that just got solved – much like the kind of cosmology I used to work in. The cover of Iran. 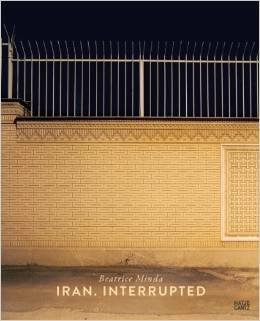 Interrupted by Beatrice Minda shows a seemingly insurmountable wall that has some fencing on top for good measure. The image can serve as a metaphor for a country whose mores differ so much from our, but maybe more so as one of our own mental approach to it. For the past decades, the West has been happy to shut itself off from Iran, whose cultures dates back to times when there wasn’t all that much going on in large parts of the Western world. While extremist hardliners are furiously attempting to torpedo a possible deal over Iran’s nuclear program, there now appears to be a chance that re-engagement will finally be possible. Iran. 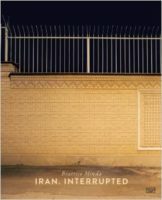 Interrupted offers merely a glimpse, but what more could photographs possibly do anyway? There are no depictions of people. Instead, the viewer is faced with the kinds of deadpan photographs of building interiors and exteriors that have come to dominate large parts of contemporary photography. So it is up to the viewer to respond, or at least to react. Say whatever you want about deadpan photography, but it does its job well. As a viewer, you need to look carefully, and you cannot expect to be served easy, simple solutions or answers. We’ve had too many easy answers about Iran over the past few decades anyway. But there also is a block of text at the end of the book that provides welcome insight into what is actually depicted in these photographs. Details in photographs that at first little have to offer are filled with meaning, such as, for example, a book on a stand, which reveals the fact that the Qur’an in this particular household might be frequently used (hence the stand). A disused swimming pool ends up as being disused not because it has lost its purpose, but rather because it is visible from the outside. Etc. Iran. Interrupted was made with all the right attention to detail, letting its photographs do their work, while, at the same time, enhancing the viewer’s experience through all those little details that in books so often get unnoticed.